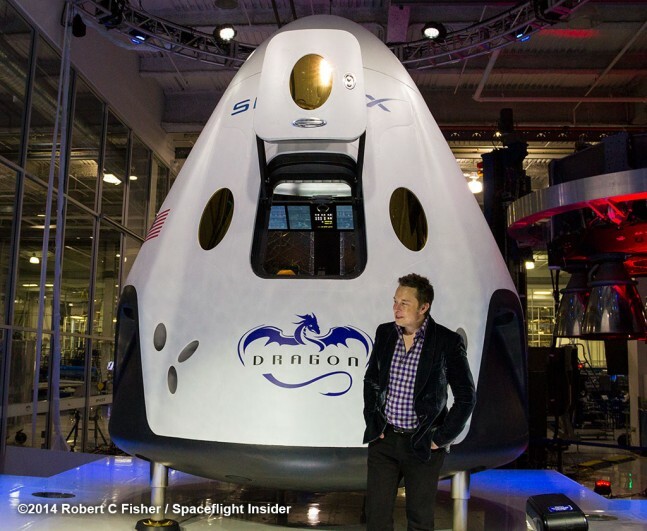 Space Exploration Technologies Corp. (SpaceX) will attempt another developmental milestone for their human-rated Dragon Spacecraft V2 by testing the vehicle’s launch escape system. The success of this launch abort system is vital to ensure the lives and safety of astronauts that could potentially ride Dragon V2 into low-Earth orbit (LEO), and further SpaceX in their pursuit of a multibillion-dollar NASA contract. Based on an original report by Dan Leone for Space News, SpaceX has two planned launch escape system tests, including a pad abort test at Cape Canaveral Air Force Station in Florida this November, and an in-flight abort test from California’s Vandenberg Air Force Base in January of 2015. This announcement was reportedly made at the American Institute of Aeronautics and Astronautics Space 2014 conference on Aug. 6 by Garrett Reisman, a program manager for the SpaceX Dragon Rider. Eight SuperDraco engines will be used for Dragon V2’s launch escape system and are designed to provide several unique capabilities when working together. Each engine will produce 16,000 pounds of thrust and have the ability to be restarted several times if necessary. Not only will the SuperDraco engines have launch abort capabilities on the ground and in-flight, but will also serve as an advanced vehicle control thruster, which SpaceX plans to use for precise guided ground landings. The SuperDraco thrusters passed their qualification testing right before SpaceX unveiled their new Dragon V2 Spacecraft on May, 29. The engine chamber and other components for this rocket engine are produced in-house by SpaceX using revolutionary 3D printing technologies, designed to lower costs and help increase manufacturing speeds. Both of the upcoming tests of the launch escape system will demonstrate the ability of the SuperDraco engines to be used at any time before and after launch. The November test in Florida will use a V2 mockup to simulate a pad abort test, and in-flight abort test will be conducted in January, though no official word or detailed information has been released by SpaceX. What is known for sure is the importance of this test to prove the launch abort system for the Dragon V2 as a requirement for NASA’s Commercial Crew Integrated Capability (CCiCap) initiative. Boeing’s CST-100 spacecraft and Sierra Nevada’s Dreamchaser spacecraft are also in direct competition with SpaceX’s Dragon to complete several complex developmental milestones, that will inevitably lead to one or more companies being selected by NASA to launch manned missions to the International Space Station (ISS) by December 2017. SpaceX already has three planned launches from the Cape Canaveral Air Force Station in Florida for the remainder of this year. AsiaSat 6 has a planned launch on Aug. 26, just 21 days after their latest launch of AsiaSat 8 on Aug 5. Their CRS-4 mission to the ISS for NASA will take place on Sep. 12, and provide a replacement set of batteries to make repairs for the ISS, in addition to other supplies and scientific experiments. And two months after CRS-4 on Nov. 26, SpaceX hopes to fly Dragon to the ISS again for their CRS-5 mission for NASA. Unless rescheduling is needed or other setbacks occur, expect SpaceX to continue to stay in the headlines, as this ambitious private spaceflight company continues to increase their presence in Earth’s orbit.